Every two weeks, Big Issues focuses on a newly released comic book of significance. This week, it is The Highest House #4. Written by Mike Carey (Lucifer, The Unwritten) with art by Peter Gross (Lucifer, The Unwritten) and colorist Fabien Alquier (Millennium, Bob Marone), this issue showcases how publication design informs storytelling as a series originally created for large French hardcovers is published in oversized single issues for U.S. readers. This review reveals major plot points. Reading is the easiest way to travel. When you’re immersed in a book, you’re transported to a different place, and exposed to new experiences that can change how you move through the world when you put the book down. It’s a mix of escape and education, and reading can be dangerous in a society that wants to prevent upward mobility. The slaves of The Highest House have the opportunity to buy their freedom if they can come up with the coin, but limited resources and spirit-breaking power structures prevent them from rising to a position where they can enact sweeping social reforms. One slave boy is the exception, and after being physically elevated for his duties as a roofer, Moth is intellectually elevated when he’s finally taught how to read. The Highest House is the latest collaboration between writer Mike Carey and artist Peter Gross, who previously worked together on Lucifer, the longest-running Sandman spin-off, and The Unwritten, one of the last breakout hits of Vertigo Comics. Both of those books are steeped in dense mythology—Lucifer expanding on concepts introduced by Neil Gaiman, The Unwritten using all of literature as the basis for a metafictional narrative—but The Highest House is a more subdued, contained, and personal story that succeeds because of the specificity in the script and visuals. The plot will be familiar to fantasy fans, with a slave boy achieving greatness with the aid of mystical forces and his own courageous, compassionate heart, but the details are what make this environment and Moth’s experience so engrossing. Carey, Gross, and colorist Fabien Alquier aren’t working on a monthly schedule with a restrictive page count, so they can slow down and situate readers deep inside this setting. The most compelling thing about The Highest House is the city and discovering its secrets as Moth grows older and gains different kinds of access, and the relaxed pacing is especially effective at the start. A highlight of the first three issues is the page breaking down the different aspects of Moth’s new role repairing the highest points of the Highest House. It’s an illustrated introduction to the basic process and tools for applying and replacing roof shingles, and it’s not necessary at all, but greatly appreciated. It provides valuable context for Moth’s relationship with the city, and he doesn’t just live in it, he takes care of it. At the start of The Highest House #4, the adolescent Moth has just experienced his first big heartbreak after learning the princess he lusts after is in love with her handmaiden. The issue reveals more about the forbidden romance, and upon learning the pain these women have had to endure to be together, Moth’s resentment is replaced by sympathy. Moth is faced with constant pressure from a dark force, but he’s always drawn to the light. He’s noble to his core, and willing to put his life on the line if it means he can help another person. This issue puts Moth’s heroic spirit to the test when The Highest House comes under attack by traitorous allies, and he continues to care for his city by rousing the other slaves to fight back the soldiers trying to invade. The Highest House series was originally published in France in large hardcover “albums,” and IDW makes the right choice in keeping those oversized dimensions for the single issues released in the U.S. Publishing this book at the standard single-issue size would have been disrespectful to the creators, who structured their story around the expanded dimensions of the series’ original format, and the rhythm of each page would change if these dense layouts were cramped into a smaller product. IDW went with a format that makes this book look special, and you get a sense of the publisher’s excitement about the material in how they choose to release it. The dimensions of The Highest House may create some frustration when it comes to shelving and storage, but it also provides an opportunity for retailers to showcase a book that stands out from the pack. The production design is a significant step up from the typical single issue, and the cover has spot-gloss that makes the comic shimmer when it’s displayed. 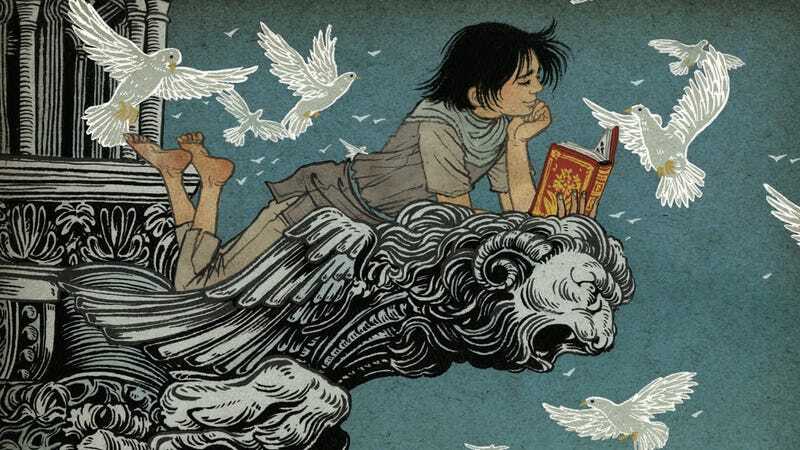 Yuko Shimizu worked with Carey and Gross on The Unwritten, where she created covers that were delicate, dramatic, and brimming with raw emotion. Shimizu’s cover for The Highest House #4 shows Moth reading a book atop a gargoyle jutting out of a stone tower, and it’s an image that radiates freedom and joy. The doves flying around Moth accentuate this feeling of liberation, and the boy’s happiness is intensified by the contrast of his relaxed body language and soft smile with the harsh faces carved into the tower. The spot gloss also plays a pivotal role in the texture and depth of field of Shimizu’s art. The sheen gives extra weight to the black lines of the stonework for Moth’s elevated reading perch, and having non-glossy doves fly in front of the structure reinforces the three-dimensional space and the height of the tower in relation to the buildings in the background. Carey and Gross are working within a European style of comic-making that packs a lot of information on the page, and Gross has the time to put more thought into the overall page design and render each panel with a precise, finer line. A major element of Gross’ design sensibility is panel bleeds, and The Highest House #4 makes masterful use of this technique to establish an expansive environment around these characters. In the case of Moth, that expanse is the sky, and it becomes visually connected to the act of reading thanks to a pair of full-page panel bleeds. There’s a panel of the city’s rooftops along the bottom of the page when Moth asks the princess to teach him how to read, and that panel bleeds up so that the conversation is framed by the stars shining above the buildings. The next page has a similar bleed, but there have been some notable changes to the bottom skyline. Moth now sits on a roof with a book, there are no stars in the sky, and all the color has been replaced by white lines on a black background, marking a shift in Moth’s perspective now that he’s been enlightened. The buildings still bleed up behind the other panels to suggest that sprawling emptiness above Moth, and even though there’s a lot of action happening in that space on the page, the bleed changes the framing of that panel to incorporate that potential negative space. Splash pages are far less common in this larger comic-book format, and in these first four issues of The Highest House, there have only been two: the two-page splash revealing The Highest House in all its splendor, and a page showing a rooftop view of the city at night. The splash pages have been entirely focused on the spectacle of the city’s architecture, but the atmosphere changes when you’re at the bottom looking up instead of vice versa. One of the most striking pages of issue #4 takes place on the low road outside the city, where different clans have gathered to meet the lord of The Highest House. The top panel is an establishing shot showing the city elevated in the background while the soldiers meet on the road in the foreground, but that foreground actually extends all the way to the bottom of the page thanks to a panel bleed. Trees, rocks, and bushes border the overlaid panels to set this natural landscape apart from the city, and by using a bleed to incorporate that extra space, the city appears even higher on the page. Elevation is a key component to this series, both in terms of visual design and narrative themes. The hero is a named after a flying insect, and even though he’s tethered to the ground by his slave status, he’s made a home for himself on the rooftops, where he can dream of a life of freedom for himself and his friends. The artwork strengthens these plot threads with page layouts that heighten the rising sensation, and because this is a more intimate, smaller-scale story for this creative team, it prioritizes emotional storytelling and finds ways to fold the magnificence of the city into imagery that speaks to the characters’ deeper feelings.